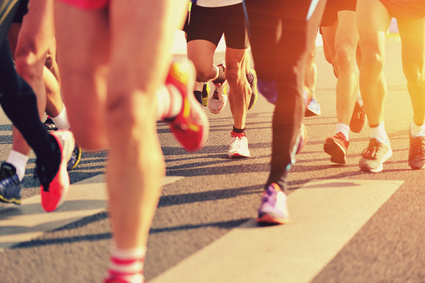 We have several Texas Orthopedics patients, past and present, who compete in the Austin Marathon each year. This year's race is just a few days away (February 14th), and whether it's your first, or twentieth, training for and completing a marathon is a huge accomplishment. Race day is not the time to try out new shoes, socks, or fashionable leggings. Wear the shoes and clothes that are most comfortable and that you have already been training in so there is no unexpected tightness or chafing. Stick to your regular food. There should also be nothing new introduced into your diet in those days leading up to the marathon. Make sure you are consuming enough calories and a balanced combination of carbs, fats, and proteins in your pre-race meals. Stick with foods you know that your body tolerates well. And plan your race snacks ahead of time to either carry with you or plant with your supporters along the way. Give yourself plenty of time to prepare before you take your mark. You'll want to arrive early enough at the start location to be able to stow your belongings, use the restroom, tighten your laces, and either Zen out, or rock out, for a few minutes to your favorite tunes before you are on your way. Create a positive sentiment to replay in your head throughout the race. Run strong. Or, you can do it... whatever motivates you. Reciting this a few days before you run, and sharing it with your supporters who can reinforce it along the route, will give you a mental edge. Don't leave it until the moment you cross the finish line to discuss with your friends and family where you want to eat. You will be exhausted and likely have a difficult time making decisions at this point. Pick out a favorite restaurant, or meal, for your celebration and make plans ahead of time. If you know you just want to get back home to relax or have a massage later that day, plan for that too. You might also make sure you have someone to drive you home following the marathon, as your legs will be weak. And if you feel that you have suffered any injuries while running, make sure to get medical attention right away. Good luck from Texas Orthopedics!